Zaric only has two works on display, one black and one white, both examples of abstract expressionism. Both are rested along a back wall of the gallery, standing side by side, roughly six feet tall and eight wide. The two are a clear dichotomy; the former shows barren storm lands, mottled with brown and slathered with drips and splotches of color. The latter is a blanket of white, but almost weighted down in appearance. The white drifts look heavy, burying something as pockets of black and gray peak through. Both canvases are ruddy and tactile. 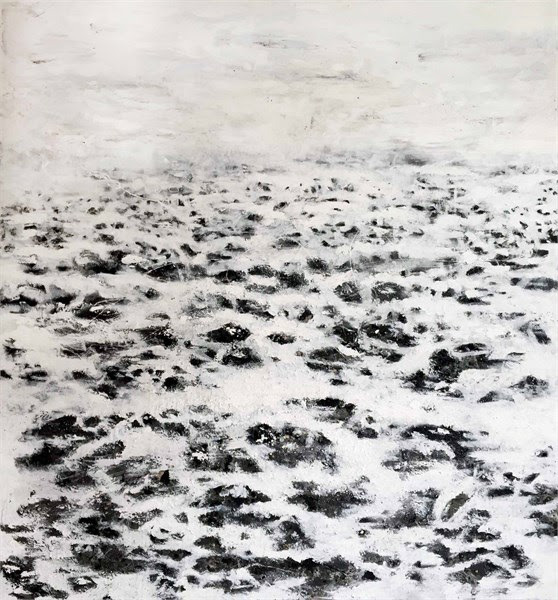 The paint is layered thick and Zaric includes fragments of sand and earth to provide depth to his piece, superseding the canvas and disturbing the comfort of the traditionally two-dimensional space. The black canvas, titled “Black Series II,” shows dark and ominous clouds over a field. The ground, although the least definite aspect of his work, shows the senseless nature of war. Colors overlap and swirl, yet are given a sense of motion, constantly rolling over one another. As a person of Croatian descent, raised hearing stories of family trapped in this conflict, I know how similar the peoples of the Balkans actually are. Croatians, Bosnians, and Serbs all speak a nearly identical language, but ignore the clear similarities to declare each language unique. Although I can only speculate as to Zaric’s experience, these mixing waves of grim earth tones can easily reflect how similar the people of former Yugoslavia are, especially in the maelstrom of war. The only clear images in the work are three ragged fence posts with long shadows. According to the artist’s press release, these posts reflect a loss of community and broken borders as communication broke down between various groups of people. Each stroke of the brush on “Black Series II” is distinct. Streaks of diluted paint visibly drip down the canvas like tear tracks until they fall into the thick-textured paint of the war scene below. There are scratches on the canvas as well as incoherent dashes of blank canvas, reminders of the gravity of the painting through the physical force such short and sharp marks would require. They are also indicative of Zaric’s restraint. He is unwilling to let these small marks of anger consume his entire work. Noting the direction of the shadows, however, one can see that the storm is on a gradient. One side of the canvas is in utter darkness but slowly transitioning to lighter grays and the assumed sun on the murky horizon. Following this gradient from left to right, the eyes fall on “White Series II,” an inundation of bright white alluded to in its sibling work. The canvases are not identical, neither in setting nor in exact size, but both show a muddled sky, now in white, with a distinct horizon line and a scene on the ground below. The white paint floods the ground, flowing in the crevices made by peaks of black that still remain. There is clear motion in Zaric’s strokes as the white suppresses the darkness beneath it. Zaric’s skills as an artist are reflected in how he is able to manipulate a blank canvas to cover such a swath of experiences. There is calm in the pale white, but not necessarily peace. The coarse rivers of white can evoke healing but also represent a burial mound for the losses sustained in this action seeking its end. In the end, however, there is nothing. White is as close to blank Zaric can make the canvas. Being only 31, Zaric addresses violence and chaos witnessed at a young age. He nevertheless takes on the responsibility of representing the overarching sentiments of many diverse peoples, and successfully addresses their sorrows, confusion, and hope. Zaric has expressed his optimism in the face of the Balkan conflicts, and his art reflects that. Two works cover a vast scope of the human consciousness in wartime, creating both a memorial to the past and a message of hope for the future. Mike Bergin Mike Bergin is the former Leisure Editor for the Georgetown Voice. He is currently The Voice's Foreign Correspondent in Denmark, and he misses D.C. You can follow him on Twitter @mbergin95 and stay tuned for his "Mysteries of History" Podcast, coming soon to the Voice Podcast Network.